In this outrageous comedy from the writers of The Hangover, Amy (Mila Kunis) has a seemingly perfect life - a great marriage, over-achieving kids, beautiful home and a career. However she's over-worked, over-committed and exhausted to the point that she's about to snap. 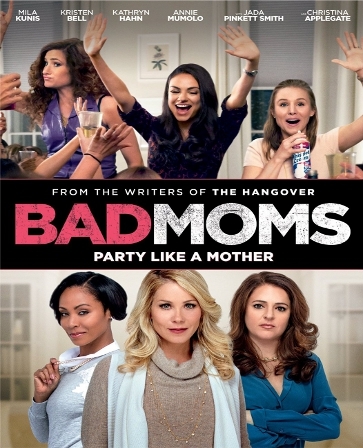 Fed up, she joins forces with two other over-stressed moms (Kristen Bell and Kathryn Hahn) on a quest to liberate themselves from conventional responsibilities � going on a wild, un-mom-like binge of long overdue freedom, fun and self-indulgence � putting them on a collision course with PTA Queen Bee Gwendolyn (Christina Applegate) and her clique of devoted perfect moms (Jada Pinkett Smith and Annie Mumolo). See the movie that critics are cheering as "�a funny, giddy, sentimental laugh-in�" - Manohla Dargis, The New York Times.